Meet the new 2018 Toyota Highlander. This new model offers safety, performance and exceptional value. The Highlander was one of the first midsize crossovers on the market and continues to deliver exactly what a family vehicle should year after year. With sleek and strong exterior styling, the new Highlander is sporty yet sophisticated. Its well designed cabin with expansive side and back windows allow the driver ample visibility. Special exterior trim features such as the silver-painted from grille on LE, LE Plus, and XLE models and painted chrome finish grilles on the Limited and Platinum grades create an upscale look for this go anywhere vehicle. 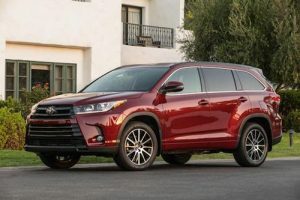 Powered by 3.5-liter D-4S Injection V6 engine mated with a 8AT 8-speed automatic transmission, the new Highlander is not only powerful but efficient. Fuel economy for this model is boosted with Toyota’s Stop and Start Engine System which shuts off when the vehicle is at a complete stop and smoothly restarts when the driver lifts their foot from the brake pedal. The 2018 Highlander is well equipped with a variety of convenience and safety features. The advanced Toyota Safety Sense P (TSS-P) driver-assist technology is standard on this model. The system uses millimeter-wave radar and a camera sensor to identify pedestrians or vehicles in its path. When necessary the system will apply automatic braking. Other safety features include Lane Departure Alert with Steering Assist, Dynamic Radar Cruise Control and Automatic High Beams. A variety of versatile seating and cargo configurations are possible with the Highlander. It offers three rows of seats and up to 158.7 cu. ft. total cabin volume. A second row sliding seat function on the driver and passenger side of the vehicle allow for easy access to the third row. Designed to be family friendly, the Highlander is also equipped with Honda’s Driver Easy Speak system that allows the driver to easily communicate with back row passengers by broadcasting his or her voice through the rear speakers in the audio system. Our Toyota Dealership near Laconia, New Hampshire is pleased to offer this exceptional vehicle at an affordable price. Please ask us about dealer specials and other current offers.